PS3000 pro series power return tape measures feature a patented end hook that lasts 10 times longer than ordinary end hooks and have a ny-clad coating that extends blade life. The rubber cushion shell of PS3000 pro series power return tape measures protect tape from impact and improves grip. PS3000 pro series power return tape measures are a compact size for comfort and easy storage and a feature a removable belt clip. The PS3035CME Lufkin Pro Series Power Return Tape Measure is one of thousands of quality tooling products available from MRO Tools. 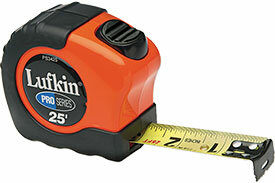 Please browse Lufkin PS3000 Pro Series Power Return Tape Measures for tools similar to the PS3035CME Lufkin Pro Series Power Return Tape Measure. PS3035CME Lufkin Pro Series Power Return Tape Measure description summary: PS3035CME Lufkin pro series power return tape measure. 3/4'' Blade Size Length: 16' (5m) Blade Style: A13 Quantity discounts may be available for the PS3035CME Lufkin Pro Series Power Return Tape Measure. Please contact MRO Tools for details.